Many years ago, I was able to golf fairly often and therefore, became fairly competant. Sadly, many days have passed since then and my game has gotten quite rusty. Recently, a friend asked me to join him one morning for a round on the links, and so with a bit of apprehension I met up with him at the first tee. I hit my tee shot very solidly… and very far left. It's never good when the starter (who sees every tee shot of the day) says, "You won't be finding that one." Fortunately, my friend believes in "mulligans". You may not be familiar with that term. A mulligan is golf lingo for a "do-over". Many golfers use them on the first tee of the day, but some choose to save them and use them later in the round. I've been with some golfers who have not just used mulligans, but have also invoked hooligans, shenanigans, and doagains. The beauty of a mulligan is that you can pretend like a bad shot never happened. You simply do it again, and don't count the first one. Wouldn't it be great if we had mulligans in life? What if we could sometimes just eliminate a bad choice, do it over, and pretend like it never happened? Would your life be in a better spot today if you had taken a mulligan or two? Here's the bad news: Mulligans aren't allowed in real golf. 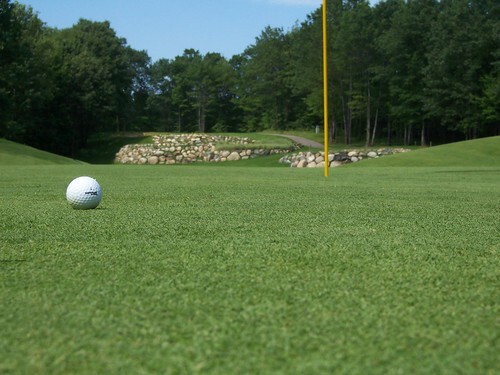 See, if you lose a ball off the tee and then hit another one, your ball may be in a good place now, but that second tee shot counted as your third shot. In real golf, if you make a mistake, you get penalized. You can still start over, but there is a price to pay. That's pretty much like life. You can always start over, but that doesn't mean you don't have a price to pay. A new start may help you mitigate the long term consequences of a bad decision; but it probably won't eliminate all the ramifications. In most of life, you can have a "try again" but there really aren't any "do overs". What you've already done, can't be undone. But, that shouldn't be depressing. This should be inspiring! If we can't eliminate our mistakes, we might as well embrace them and learn from them! If we have to pay the piper for our errors, we might as well get our money's worth. Rather than bemoaning the sad state of our life, we can choose to figure out what went wrong and then take steps to ensure it won't happen again. Don't settle for a general excuse of why you failed. Figure out the exact decision, action, or conversation that caused the problem and determine exactly how the problem you now face was caused by that source. If you can't pinpoint exactly what went wrong, you'll never make it right. Fixing the problem may be easy, or it may be very difficult. It might be as simple as replacing a faulty part or finding a missing screw. And it might be as difficult as humbly apologizing to someone and admitting your error. If the problem was an accident, clean up the consequences; if the problme is systemic, fix the system. You've probably heard the definition of insaity often attributed to Albert Einstein, "doing the same thing over and over again and expecting different results." If you want to avoid the same mistake, you have to change your life. Go different places, do different things, form different habits, develop different relationships, read different books, etc. Consider what needs to change, then do things differently. Life gives no mulligans. But if we are willing to learn from our mistakes, we don't need a do-over, we just need to pay attention.